I do not know where my thoughts go when I am done thinking them. My bear brain is quite active. I have thoughts and ideas and memories and other unidentifiable things going on in there practically all the time. It is rare my bear brain feels switched off, and even when it does feel that way, I usually end up thinking about how it feels that way, which switches it right back on. But all of these processes that go on in there are not going on all the time at the same time. That would be overwhelming, I am sure, so my bear brain tends to a task or thought or an anything at all one at a time. That makes everything more manageable, of course. I am, however, often bothered by the idea that these thoughts and such just go when I do not need them. It bothers me simply because I do not know where, exactly, they go. Everything in the forest can be touched and moved and smelled, so it is usually quite easy to keep track of the comings and goings of these things (except squirrels for obvious reasons). Thoughts are not like that. They do not have a cave they head home to when they are done for the day. They do not wait around in a perceivable place, anticipating your next need for their use. I have no idea where they go. Some can get memorized, which I guess is as close to a cave for them to go home to as there gets, but even that is not tangible. Even those can just go. And when they do decide to go they are gone. Sometimes these thoughts never come back. I frequently lament the loss of a thought, wishing it had stayed a little longer so I could commit it to memory, but most do not. It would be nice to know that they at least go off to a nice place. Somewhere warm and safe. But part of me believes that they go on to nothing. They simply stop being. I do not like that thought, and it is a thought that does not really go away like others do. I try to hold onto the important thoughts. I try really hard to remember the sorts of thoughts that make forest living easier, but I am sure I have even lost some of those. And when they are gone, they leave nothing behind but a strange, fleeting empty feeling. Then again, maybe they can come back and I am simply unable to recognize them. 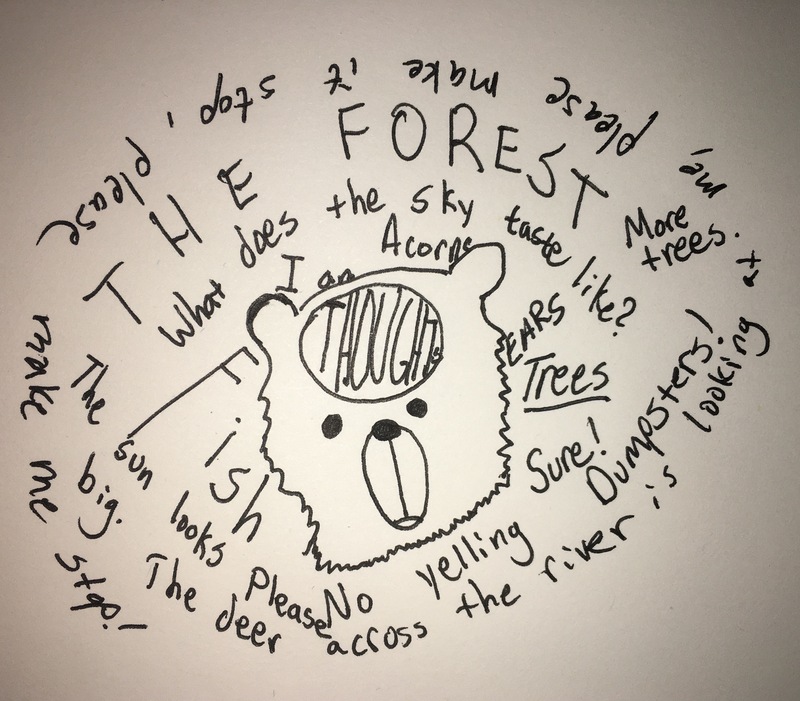 Maybe thoughts can come to my bear brain, seemingly new to me, and recycle themselves. But who knows. This entry was posted in Uncategorized and tagged @a_single_bear, bear blog, bear stuff, bears, fleeting, humor, ideas, mind stuff, thinking, thoughts, twitter on May 1, 2017 by A bear. You are a very profound bear. I, a human, hold on to negative thoughts far to long. I like how you live in the moment, and try to think positive.